You are here: Home / Baked goods / *Shortbread Cookies with DOTS! Let me begin by telling you that this post is not the result of an endorsement fee paid by Tootsie Roll Industries, the maker of DOTS. And yup, as a former marketing guy, I do use their trademark all-caps. 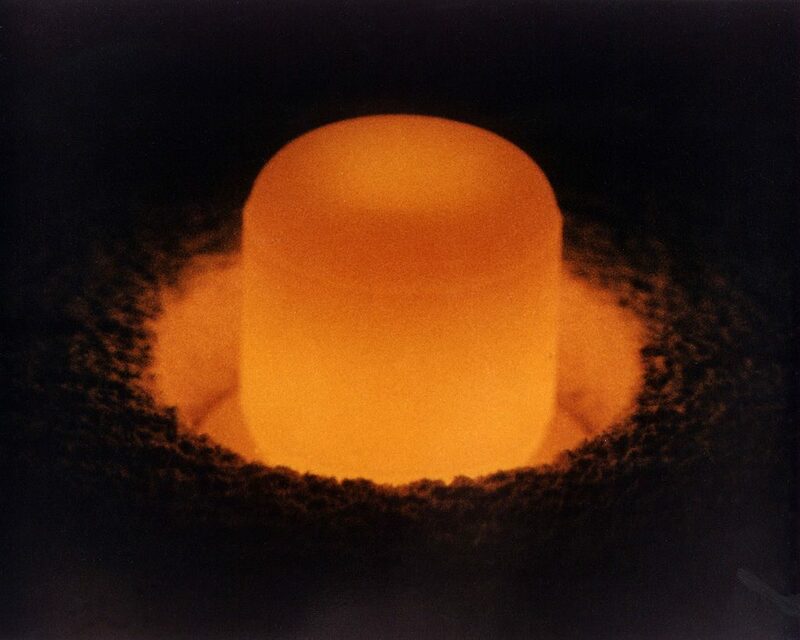 Actually, what gave rise to the DOTS cookie idea was this photo of plutonium, which looks very much like the orange-flavored variety of DOTS. I was originally going to use just an orange one in the center of the round cookies, frost them with black icing in the shape of a radiation symbol and call them Plutonium Cookies, but laziness got the best of me. Anyway, shortbread cookies are probably the tastiest simple cookies you can make. While there are many different recipes for them, the Feral Cooks method uses cake flour instead of all-purpose flour. This gives the cookie a lighter texture. Providing the same flavor, all-purpose flour gives the cookie a denser texture and crumble. Either way works, it’s just the baker’s preference. The Feral Cooks recipe also includes a few other departures from traditional shortbread cookies. 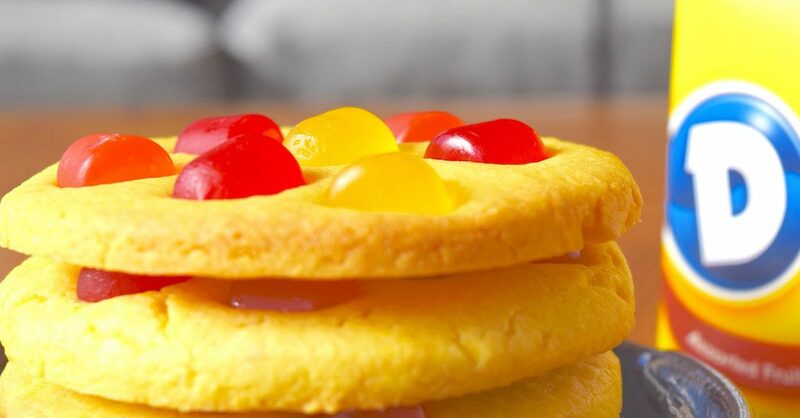 Of course, the best of these is the addition of DOTS, and using an orange extract flavoring and yellow food coloring. I was actually going to try turmeric for the coloring, but was unsure of what it would do to the flavor, as well as it possibly turning the cookies into something that could stain fingers and clothes. One could also substitute a half-cup of cocoa powder for a half-cup of the flour. You may think that the DOTS would harden and become tough in the oven, but they remain soft and delicious. 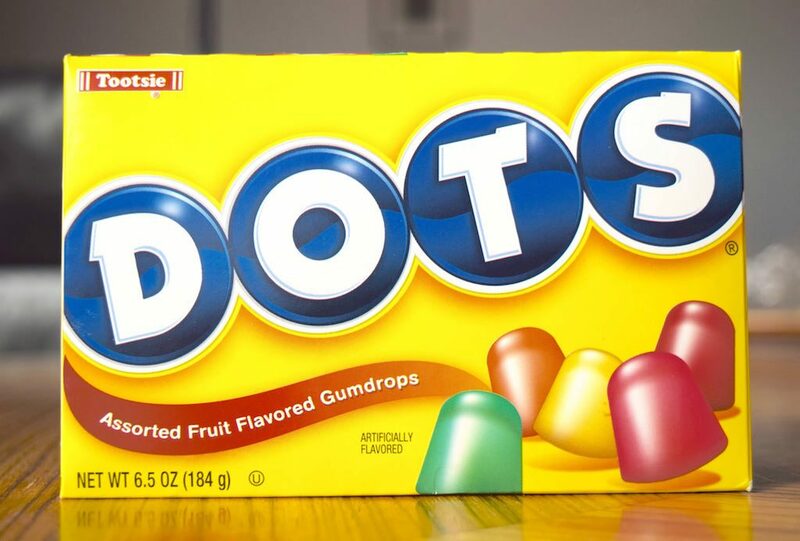 Two 6.5-oz packages of dots (one for the cookies; the other for eating while making the cookies). Cut the DOTS lengthwise in half with a paring knife while trying not to eat them. Put the butter chunks, sugar and extract in a bowl and hit them with an electric hand or stand mixer, until creamed. Add the yolks and continue beating. This is a good point to add the food coloring, if using. Then gradually add the flour and mix until everything’s just combined. Refrigerate to firm up the dough, but keep it tightly covered so it doesn’t dry out. Here’s where you have some decisions to make. When the dough has been sufficiently chilled, you can either roll it out between two pieces of parchment paper (between ¼- and ½-inch thickness), or just pat the dough directly into the cookie sheet. If you roll the dough, use whatever cookie-cutter shape(s), and transfer to the cookie sheet. I used parchment paper with no ill-effects. If you press the dough, you can cut them after cooking. When the dough is in place, press in the DOTS halves and put in a 350-degree oven for 10-12 minutes, depending on thickness. For the last few minutes, keep a close eye on them so they don’t brown. I used the convection setting to facilitate faster cooking. 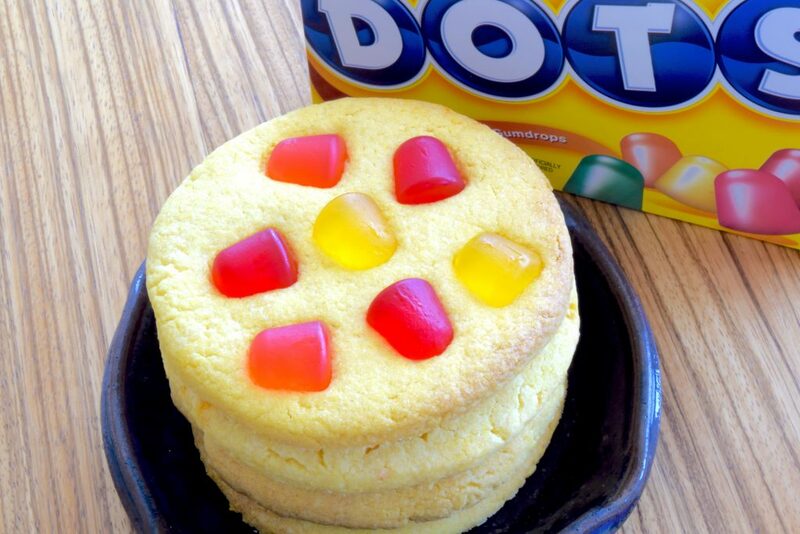 If you have any DOTS left, eat them while the cookies are cooling on a rack.